China Cuts Tariffs On Autos, Possibly Easing Trade Tensions With U.S. China is cutting tariffs on vehicles from the U.S. and other countries after President Trump railed against the imbalance in trade tariffs. The cuts could help German automakers as well as Tesla. China Cuts Tariffs On Autos, Possibly Easing Trade Tensions With U.S.
Customers look at Tesla cars at a showroom in Hangzhou in China's eastern Zhejiang province on April 4. The cut in Chinese auto import tariffs could help Tesla, which has been looking to break into the Chinese market. China is cutting tariffs on vehicles from the U.S., but the biggest benefits could go to German automakers — and Tesla, the American electric-car maker. Chinese President Xi Jinping signaled in a speech last month that the tariff cut would be coming. The foreign ministry confirmed it Tuesday: Tariffs will drop from 25 percent to 15 percent for imported cars. Tariffs on imported auto parts will fall to six percent. U.S. manufacturers and policymakers have been arguing for years that China should lower its tariffs. President Trump railed against the imbalance in trade tariffs in April, tweeting that they amount to "STUPID TRADE." The U.S. imposes a tariff of just 2.5 percent on vehicles imported from China. The tariff reduction is seen as an olive branch to the Trump administration. It comes as the two countries work to avoid a trade war after the tough-talk and tariff escalations last month. China is a huge market for the U.S. auto industry. America shipped almost $10 billion worth of vehicles to China in 2017, according to the Commerce Department, plus another $3.5 billion in vehicle parts. But much of that trade originates from companies whose headquarters are outside the U.S. BMW and Mercedes-Benz, for example, build cars in the U.S. to be shipped to China. BMW sold nearly 107,000 U.S.-made vehicles to China last year, while Mercedes-Benz sold more than 72,000, according to LMC Automotive. The two biggest U.S. car companies, General Motors and Ford, don't rely as much on exporting to China. Instead, they build the majority of cars they sell in China in that country. The Chinese market is important for both of them — GM sells more cars in China than it does in the U.S. But because most of those cars are built and sold in China, the sales are not subject to the tariffs. There is at least one U.S.-based car manufacturer that could win big from the reduction in Chinese tariffs. 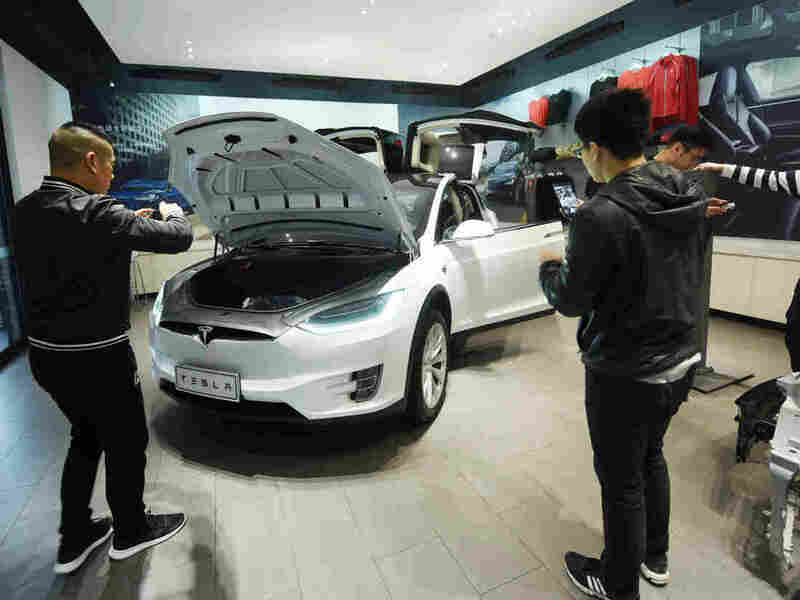 Tesla has been looking to break into the Chinese market, but the 25 percent tariff has put its already-expensive electric vehicles out of reach for most Chinese consumers. Tesla sold nearly 15,000 cars in China last year, according to LMC. China says the new tariff policy will take effect in July.